The National Order of the Arrow committee presents the Distinguished Service Award to those Arrowmen who have rendered outstanding service to the Order on a sectional, area, regional, or national basis. It is given primarily for dedicated service to the Order and Scouting over a period of years. Only a limited number of awards can be presented. Arrowmen whose service records are the most outstanding and extend the farthest beyond the local lodge level are usually selected. Young men under 21 and adults (volunteer and professional) are eligible for nomination. Nominations will not be accepted or considered for posthumous awards. The Distinguished Service Award was created in 1940 to honor those who rendered service to the Order of the Arrow beyond the lodge level. Since the time of the first awards given in 1940, approximately 500 Distinguished Service Awards have been presented. Nominations are open to both youth and adult, and must be made on form No. 24-201. Nominations must be approved by the Lodge Chief, Lodge Advisor, Council Scout Executive, who then forwards the application to the Region OA Chairman or staff Advisor. If the region concurs, the nomination is sent to the National Office. Nominations must be received by the OA Director prior to February 1 of each national conference year. 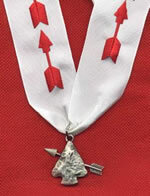 The actual award is a sterling silver arrowhead, bearing an arrow pointing upward and to the wearer's right, suspended from a white neck-ribbon upon which are embroidered red arrows. A picture of the award is below. Presentation of the award is limited. The white on red square knot badge shown above is worn on the uniform to identify recipients.